With AMD’s Ryzen 2 on the horizon, if you want to upgrade your rig (and save a little cash), then it may be a better time than ever to pick up one of the first-generation AMD Ryzen chips. Sure, the performance of these chips may be a little lower than their upcoming successors, but at the current pricing it’s hard to argue with the gluttony of cores on offer. Want the best AMD gaming motherboard to go along with that shiny new processor? Back before Christmas, AMD dropped the prices of their Ryzen processors for Black Friday. Since then, prices have fluctuated up and down somewhat but they seem to be set to stay low before AMD’s next generation of processors join the fray in April. Currently, there’s a photo-finish for the winner in our best CPU for gaming roundup, but with the Ryzen 5 1600X on offer for only £170 – a hefty 30% discount off the original asking price of £249 – it might just edge ahead. The octa-core AMD frontrunner, the Ryzen 7 1800X, is now only £281, a discount of over 40% from the original £499 MSRP. That comes in at only £31 per core, half of the price you’d pay for core parity with an Intel Skylake-X part. For our US compadres, the hefty eight-core Ryzen 7 1800X is 40% off at Micro Center from $499 to $300 (albeit for collection only) – although you can find somewhat similarly discounted pricing over at Amazon US available for shipping, too. The Ryzen 5 1600X is also up for grabs at $190, down from $249. It may be a hard pill to swallow for some, buying the older chip on the eve of the new faster chips launching. 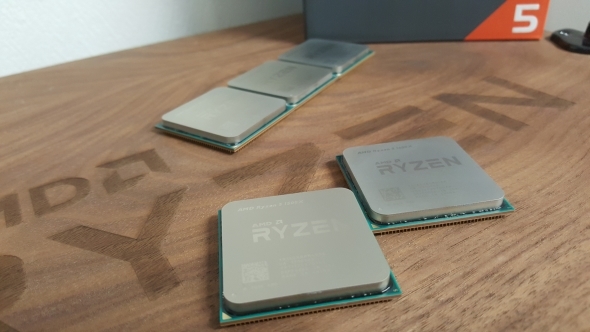 But the first generation processors aren’t so slow they need to be put out to pasture just yet, we still have Ryzen’s best trading blows with the top Coffee Lake chips from Intel – and that’s without any of the 12nm process performance boosts. Considering AM4’s backwards-compatibility, you have an easy upgrade path down the line, too.